Once I grow out my bangs, I’m always wondering if I should have bangs again. Bangs have the power to completely transform a hairstyle but they aren't for everybody. To help figure out if bangs are right for you, here are some crucial things you should know and be OK with if you decide to get bangs. Before getting scissors-happy, seek advice from your stylist, a stylist you know and trust. You need someone who will be this honest with you. Your stylist can tell you what kind of bangs will suit your face shape best. Bangs are not one size fits all. The goal is to make your face appear as oval as possible. The best way to determine whether you'll be happy with your new bangs: Try them on first! Purchase some nice but inexpensive clip-in bang hair pieces or ask your stylist if you can try some on. This way you can see what they will actually look like on your face. Call ahead to see if your salon has clip-in bangs to try in the salon. If they don't, you can find them at beauty supply stores or on Amazon. The most versatile type of bangs: Side Bangs. If you're curious but cautious, opt for a side bang. You can eventually make the jump to full bangs when you're ready. A light, shaggy bang that starts shorter in the middle and gradually gets longer toward your eyes is super versatile. They can be swept to the side, and easily grows out into layers if you decide you don't like yourself with bangs. If you're the type of woman who is always rushing out the door in the morning with slightly damp hair, coffee in one hand and breakfast in the other, you will definitely have to adjust your morning routine. Even if you don't wash your hair every day, your bangs will still need to be styled. I think the easiest way to style bangs in the morning is to Spritz the roots of your bangs with water, then use a bristle brush to blow-dry your bangs from left to right and then down, repeating if necessary. This will give a nice softness so the edges lay softly. When blowing out straight-across bangs, try to avoid using a round brush. It will only end up giving you the 1980s mall bangs. Nearly everyone has a cowlick in some shape or form. Some are hidden better than others. This can make styling bangs a nightmare. Blow-drying the cowlick in the opposite direction will help the hair stay flat. The quickest, most effective way to restyle dry bangs is with a dry shampoo or texture spray because it makes hair look lived in, but not oily and it's excellent for controlling stubborn whirls in your hairline – I like Batiste Dry Shampoo Volumizing Texturizing Refreshing Spray. Having bangs can be high maintenance, they need to be styled, need to be trimmed more often. 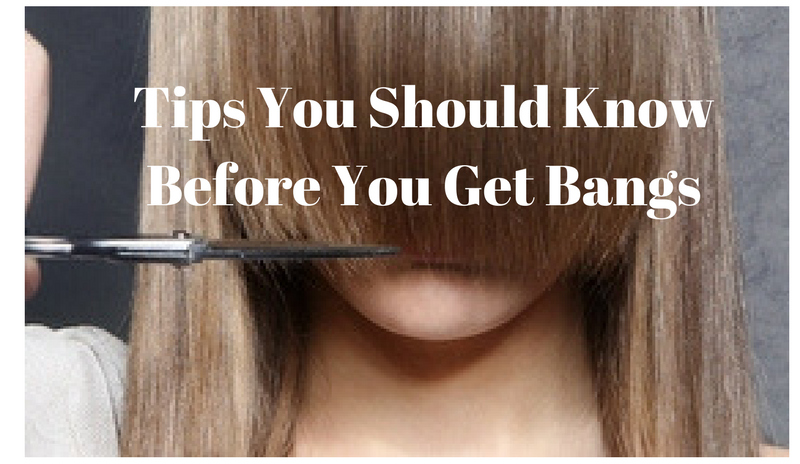 Expect to trim your bangs every three weeks to ensure they keep their style, this also gets rid of any split ends. You can also trim them yourself -just remember, hair is longer when it’s wet so only trim small amounts to avoid super short bangs. If you tend to have an oily forehead and fingers touch your hair throughout the day, it’s enough to ruin the bangs of a perfect blowout. Carrying a small bottle of Dry Shampoo in your purse can help. A few quick sprays and you will be back to gorgeous in no time. The Dry Shampoo will absorb the oil and refresh your hair. If you wake up and your bangs are greasy and you don’t have time to wash your whole head, pull the rest of your hair back and just wash just your bangs, this will refresh them without having to do a full head shampoo. It might take three to four months for bangs to grow out and you might go through an awkward stage of hair sticking out and not cooperating. Straight across bangs will evolve into side bangs eventually and side bangs will become face framing layers, but you have to be patient. Keep awkward bangs out of your face with bobby pins. Experiment with everything from braids to a fashionable disheveled look. Once your bangs have grown past your eyes, they can usually be blended into face-framing layers and disguised more easily. At the end of the day, it's just hair. It will grow back or grow out. While it's true that bangs do require a bit of extra maintenance, they are also an amazing way to change up your look without committing to anything too drastic. Hope you liked these tips! !